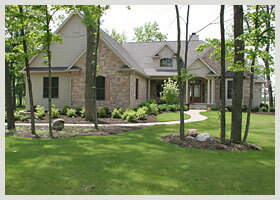 Do you feel a sense of pride every time you pull into your driveway and look at your lawn? Our customers sure do. From full-scale landscape solutions to lawn maintenance, Clean Cut Lawn & Landscape is available year-round, ready to turn your corner of the world into a place you can really be proud to call home. Unlike many of our competitors, we work with a licensed landscape architect, giving you more than a one-size-fits approach. We discuss your desires, survey your existing architecture, and design a plan to your specifications. Then, our experienced maintains it for as long as you wish, at a reasonable price. Complement your existing landscape with architectural elements that are both beautiful and functional. We install paver patios, brick patios, walkways, driveways, steps, retaining walls, and more. These long-term improvements increase both the value of your home and your quality of life. As the seasons change, so do your needs. Our staff is standing by to help you prepare for some seasons, clean up after others, and clear the way when snow gets in the way.